I’ve been a long-time Flickr user and fan ever since get­ting into Pho­tog­ra­phy. It’s been more than 5-years since I’ve joined, and to this day, I still con­sid­er it (hands down) the best pho­to shar­ing site out there. It keeps it sim­ple and just makes it easy for peo­ple to do what they want to do, share their pho­tos with friends and fam­i­ly. With the Hol­i­days upon us, we are see­ing loved ones that we don’t often see as dis­tance is usu­al­ly a fac­tor. But one thing we do to recall and make those mem­o­ries last are take pho­tos and/or videos. I had my cam­era and just snapped away dur­ing our recent fam­i­ly gath­er­ing. I then uploaded the set/album to Flickr to share it. 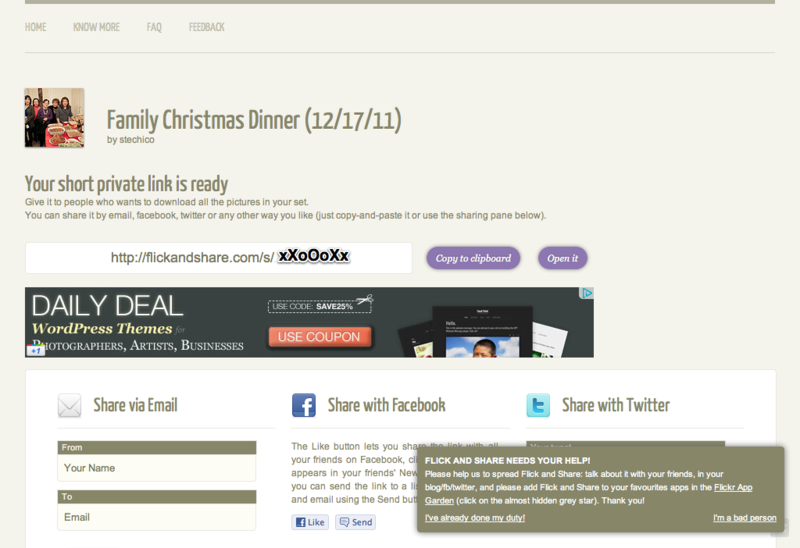 One thing that is lim­it­ing is that not all of my relatives/friends/family are on Flickr. Even then, you are only lim­it­ed to down­load on a per pho­to basis (at the moment?). As to find a solu­tion to have my aunt down­load the entire set/album, as she want­ed to get them print­ed at Cost­co, I dug around and for­tu­nate­ly found Flick and Share . Some­times you need to share a flickr set of one event (a wed­ding, a grad­u­a­tion or just that last fri­day par­ty you had) and you want your friends to down­load all the pic­tures with just one click, we solve that. It’s like giv­ing a pen­drive with your pho­tos! The thing I like about the appli­ca­tion is the effi­cient way to share a link that will allow friends and fam­i­ly to be able to down­load the set’s high-res­o­lu­tion pho­tos. 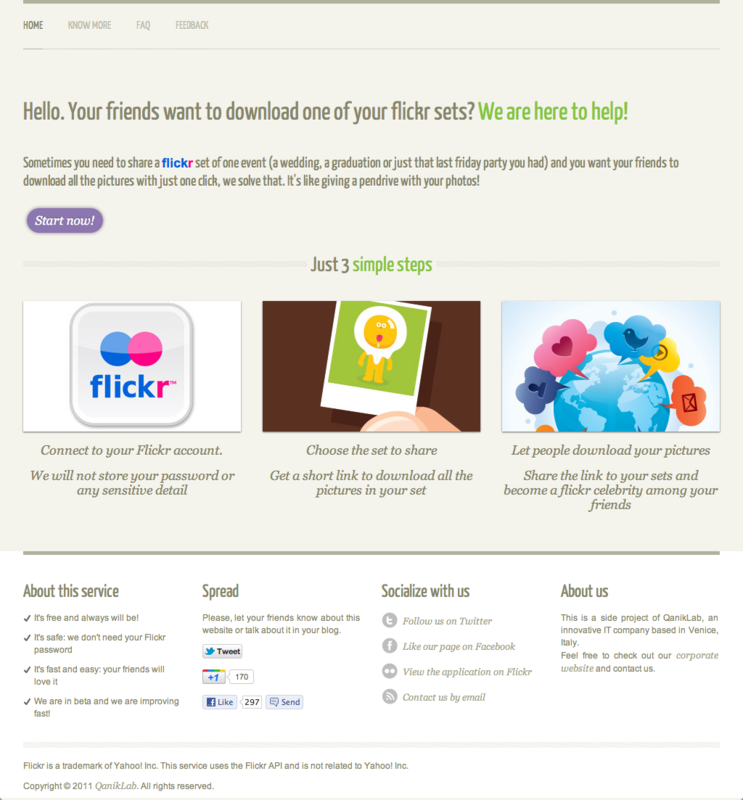 As soon as you click that “Start now!” but­ton, you are faced with an autho­riza­tion page from Flickr. 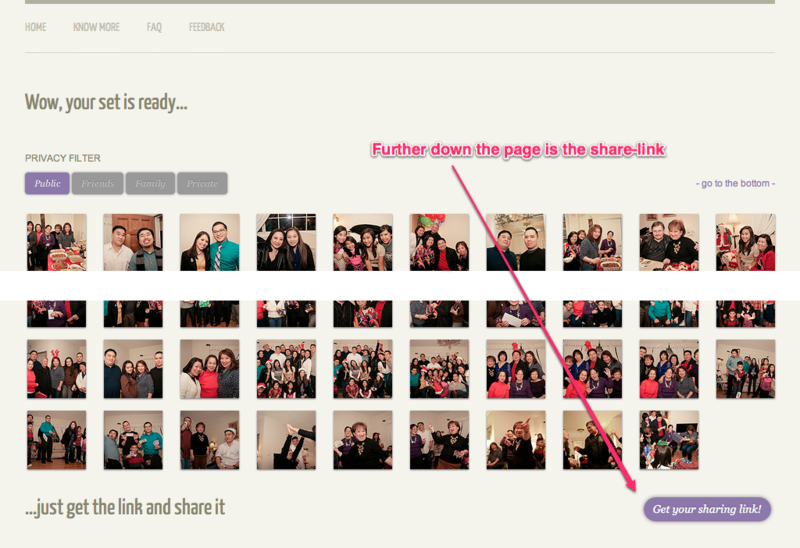 Flick and Share only requires a “read” per­mis­sion.1 After allow­ing it, you are then for­ward­ed to a page where you may pick which Flickr set you wish to share. 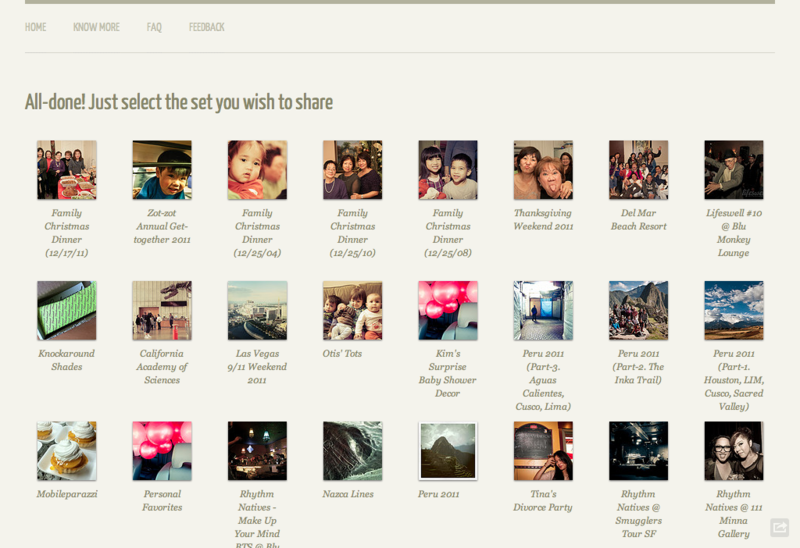 Select­ing the set, Flick and Share does its mag­ic and then for­wards you to a page where you may fur­ther fil­ter out what pho­tos you would like to share. That is, per pri­va­cy-per­mis­sion. You may have some pho­tos marked Fam­i­ly-only, Fam­i­ly-and-Friends-only, com­plete­ly Pri­vate, or by default, Pub­lic. By default, all pho­tos regard­less of pri­va­cy-per­mis­sion are avail­able for down­load. After this process, click­ing on the “Get your shar­ing link!” but­ton will land you on a page where you may copy the share-link. 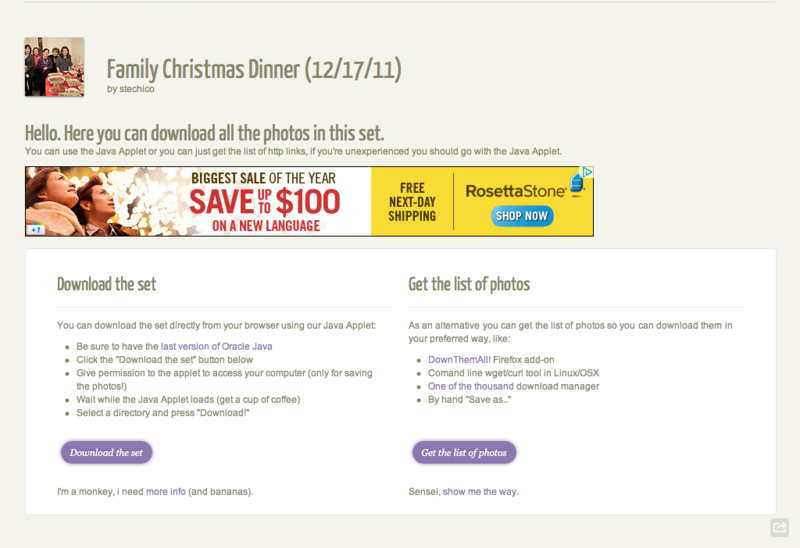 That’s all there is to it for you to get your fam­i­ly & friends to be able to down­load the set. You’ll just need to send them the link (via IM, Twit­ter, e-mail, etc.). You’ll see that some social-media shar­ing is avail­able on the same page for you to uti­lize. I hope the above helps in keep­ing your bonds tight, your smile bright, and your Hol­i­days safe and the best yet!